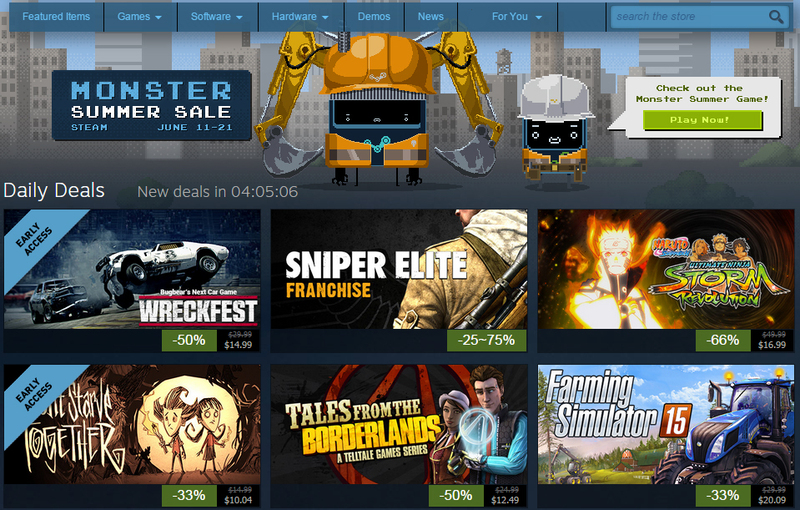 For 125 million gamers who prefer to play on their computers, Steam is the online retailer of choice, especially when it runs one of its huge seasonal sales. But while these promotions, like the current “Monster Summer Sale,” offer what appear to be deep discounts, Steam is also repeatedly accused of artificially inflating prices to make these savings look better than they are. This leaves the savvy gaming consumer (and forums full of confused ones) wondering two things: are these accusations true and, if so, is that legal? The answers are “kinda sorta” and “probably yes.” Let’s dig into it a bit, shall we? In many retail environments, the person who runs the store gets to determine at what price they will sell an item to consumers. Every supermarket buys its bananas at a wholesale price, and then decides for itself how much of a markup to put on those bananas. The same banana — or box of Cheerios, or gallon of milk, or potato — can cost two wildly different prices at two grocery stores across town, and customers will decide where to shop and what to buy based on their own list of priorities. Now imagine that the banana wholesaler always controls the prices, instead. The store no longer gets to say, “this banana cost us $0.03 so let’s sell it for $0.20.” Instead, the grocery store says, “No matter what your bananas are priced at, we are going to take a 30% cut. Also, during the second week in June, last week in November, and last week in December we have sales,” and hands over the shelf labels to the banana wholesaler to do with as they will. That last one is a lot closer to how video game digital storefronts work. In the world of games, minimum resale prices are basically always set by the game’s publisher. That’s also true on Steam. A game’s publisher sets the everyday price and any sale prices they’re willing to sell at. Steam dictates the event timing. There are literally thousands of games for sale on Steam and while some sites helpfully aggregate sale and pricing data, it would be very difficult to comb through them all. But activity around some titles in particular has caught shoppers’ attention. There are two different kinds of things going on with pricing. Here’s the first: Summer sale day arrives! A game is listed at $30, being called “50% off.” Its launch price in 2014 was indeed $60, like almost every other blockbuster-style game… but since March, it’s been priced at $40. Isn’t it, then, really only 25% off? That’s the question users have about games like Wolfenstein: The New Order, which did that exact thing. The game is being offered at a definite discount off its every-day price, but not as high a discount as the advertising would have you believe. Here’s the other: Summer sale day arrives! You’re hoping for a deal on a major new game that has so far only ever retailed at $60. You go and hit the storefront and the game you planned to buy is no longer there. Instead, you see a banner advertising a great sale on a bundle of that game with an in-game currency cash card. And that “great sale” is… $60. That, alone, wouldn’t be so bad. Annoying, but not really misleading. But then, a few hours later, the original game makes a reappearance on Steam, without the bundle. It has a “25% off!” banner on it! Hooray! Except then you click through to find that the list price of the game suddenly shows up as $80, and that supposed great deal price is… $60. That’s exactly what developer Rockstar Games is accused of doing with Grand Theft Auto V.
The pricing history for Grand Theft Auto V, via SteamDB.info. At the start of the sale, the option to buy GTAV vanished, and was replaced only with bundle choices. The “Great White Shark Cash Card” is an add-on that does indeed retail for $20 on its own, so selling the two as a bundle for $60 does technically constitute a 25% discount over the $80 it would usually cost to buy both. So is it true? Yes. Is it misleading? Also kind of yes. The good news is, negative attention seems to work. As of this morning, the game is back on the service, not in any bundles, without a sale banner, listed at its original $60 price point. The bad news is, it took a lot of complaints from a lot of players and gaming sites to make that happen. Advertising is heavily regulated speech. You’re not allowed to mislead customers or say things that aren’t true. And an internet full of inquiring minds wants to know: is all of this actually legal? Steam is global, and so are its sales. The laws, base pricing, and converted currency pricing vary around the world. But as yours truly is based in Washington, DC, and Valve is based in Washington state, we’re just going to look at American regulations. If the former price is the actual, bona fide price at which the article was offered to the public on a regular basis for a reasonably substantial period of time, it provides a legitimate basis for the advertising of a price comparison. Where the former price is genuine, the bargain being advertised is a true one. But what about that supposed $80 price point on GTA? Nobody ever actually paid $80 for that game — but that doesn’t mean it wasn’t actually a real price. “A former price is not necessarily fictitious merely because no sales at the advertised price were made,” the guide explains. Users noticed, screencaptured, analyzed, and complained about the supposed $80 price point for GTAV because this is the internet and that’s how things work. Realistically, however, that price listing was arguably an oversight, error, or mistake — it only lasted a few hours, and no longer appears on Steam. Sometimes the deals in seasonal video game sales really are killer. Backlogs fill and wallets empty during these events for a reason. But consumers need to read listings carefully, and pay attention to the bottom line. Whether it’s 50% off or 25% off, $30 for a game is still 30 of your dollars.